I am frantic. I am so far behind. I started my new blog. I am trying to do the "31 Days to Build a Better Blog" challenge and am woefully behind. I leave for New York City for the first time for the Blogher Conference NEXT WEEK! So what do I do? I go out of town for 3 days. Then my sister's children are in town so my children want to spend every waking moment with them. I HAVE SO MUCH TO DO! I guess it should be referred to as "every woman's lament." We all have so much that we need to do, and so much that we want to do. There is never enough time in the day. So yesterday when I was thinking that I could get caught up a little in my own little blog world, my children wanted to meet their cousins at the beach. I was irritated. I started to climb up on my martyr pedestal and list all of the things I was doing for everyone else and is it too much to ask for a little bit of time. One major problem with being a martyr is that everyone misses out. I pulled myself together and grabbed our beach bag. It was a beautiful day at the beach. 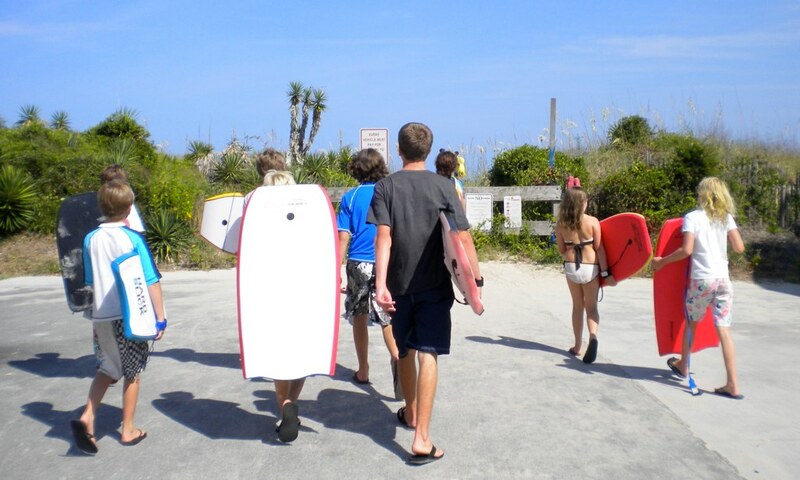 The tide was out, the water was somewhat calm but waves were breaking enough on the sandbar for some boogie boarding. The blog is still here. I still have so much I want to write and so much I need to do to be ready for the conference BUT I had a beautiful afternoon watching my kids and their cousins splash, laugh, and ride the waves. I cannot do it all, therefore I to choose to play when I can. This was our crowd heading over to the beach. And just a few of the waves that were caught! the "stuff" will always be there....but someday the house will be painfully quiet! God led you in the right direction as He always does....when we let Him! There actually IS time for everything! Enjoy and HAVE FUN! I just tried to start the 31 days to a better blog on Aug 1st. Of course I got as far as day 3 and then BlogHer hit :-) Would love to walk through it together if you are still doing it! Andrea, YES, will email you but I had to give up because of Blogher too. Would love to have someone to walk through it with!! !